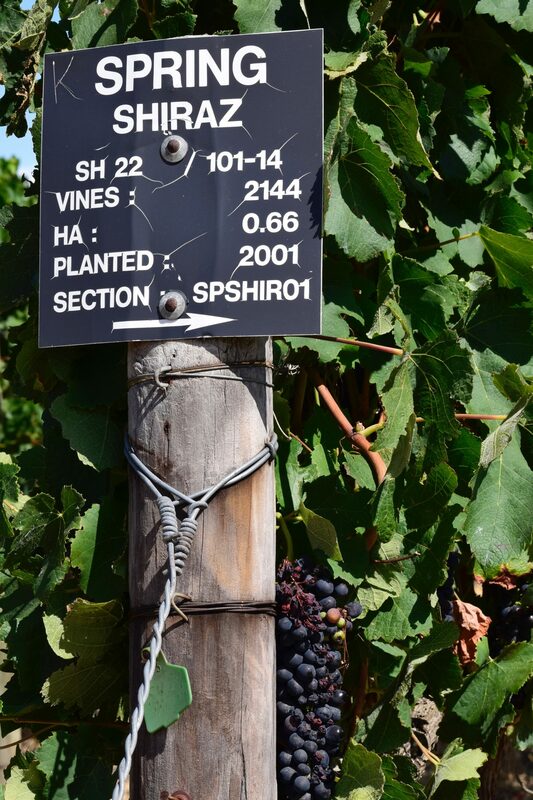 Stellenbosch is the dramatically beautiful, wine-producing region in South Africa. 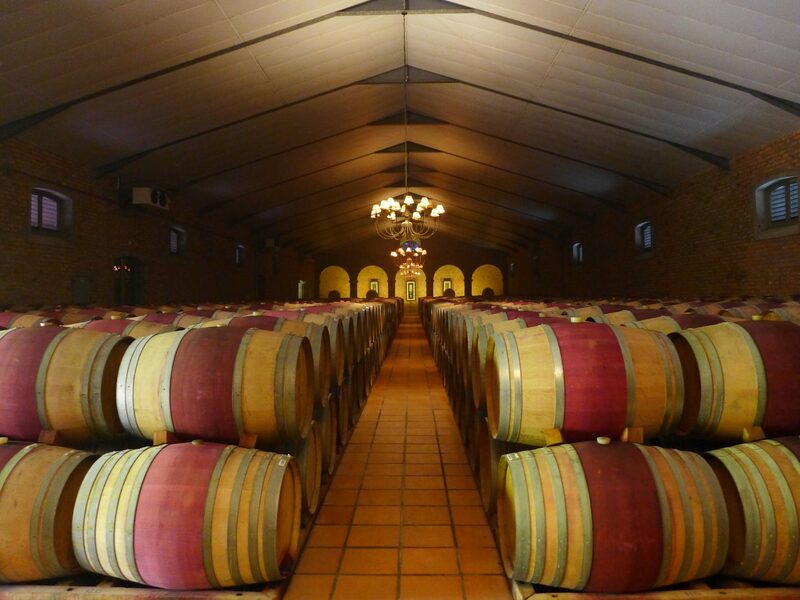 No visit to the country is complete without a Stellenbosch wine tasting (or two). Pair the wine with a food tour and learn about South Africa’s favorite foods, like biltong and bobotie. What waits at the end of this dramatic driveway? 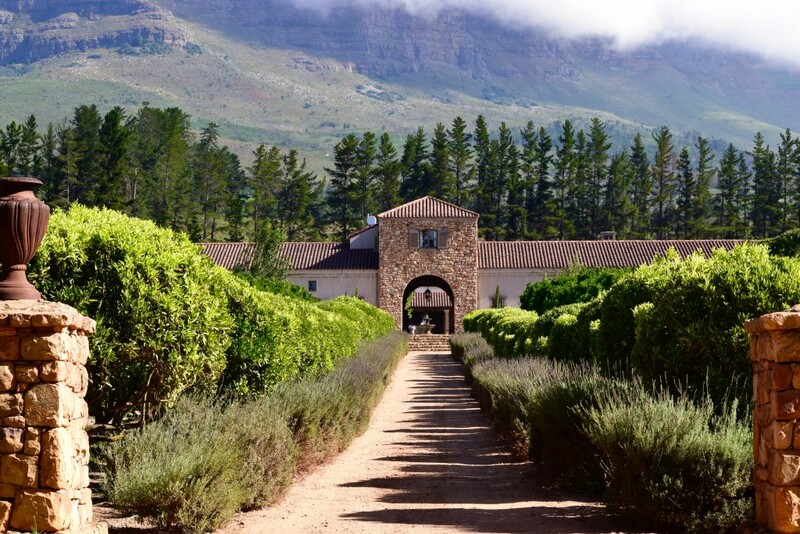 A wine safari at the Waterford Estate in Stellenbosch. Photo: Cathy Bennett Kopf/The Open Suitcase. I’ll give you two guesses. Napa? No. Provence? Negative. It’s the Waterford Estate in Stellenbosch, South Africa, a destination brimming with magnificent vineyards. After days of intense touring in Cape Town, it was time to kick back and relax and let someone else handle the wine pairing. Exploring a new area via my stomach is one of my favorite ways to get acquainted. About an hour’s drive west of Cape Town lies Stellenbosch. The town was settled by the Dutch in the late 1600’s because of the rich, fertile soil. Farms were established to grow produce to feed the sailors passing round the Cape of Good Hope and, where there’s food, there must be wine. French Huguenots seeking freedom from religious persecution settled in the area and, apparently, they never left home without their grapevines. What all this means is that South Africa produces some really good stuff to eat and drink. Stellenbosch is a cozy town with petite, bone-white buildings, and streets lined with stately oak trees. 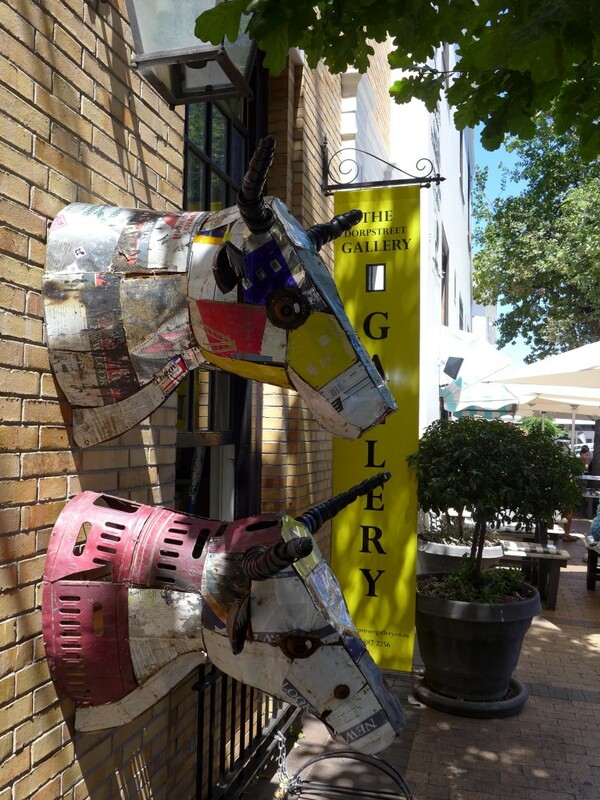 Interesting art installations dot the sidewalks, entrants in the “Reflections” exhibit curated by the Stellenbosch Outdoor Sculpture Trust. Hanli talked about the history of South Africa’s second oldest city as we strolled along Dorp Street, the wagon road that connected it to Cape Town. Today, Stellenbosch is home to more than 200 wine and grape producers, a university with over 30,000 students, terrific restaurants, boutique lodging, shops, and art galleries. Our first stop was Schoon de Companje, a hodgepodge collective of artisanal food offerings. It was worth walking in just to smell the fresh bread as it was baking. 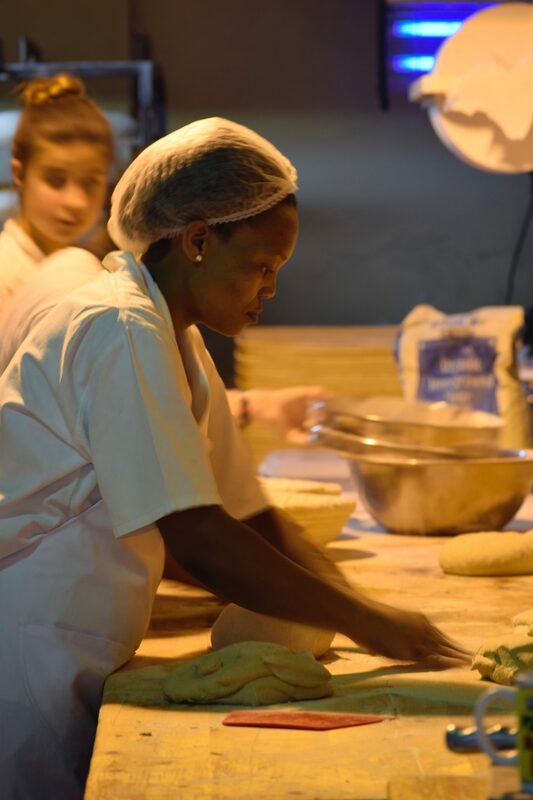 The day’s loaves are displayed on racks with name tags that describe their origin, preparation, and ingredients. For example, the “ancient grain bread of the day” was made with a rye sourdough starter, buttermilk, dark beer, honey, sesame and pumpkin seeds. Hanli purchased some bread sticks and ushered us to the Brampton Wine Studio. Despite my best effort to resist, it appeared that 11:30 was the right time to start drinking. She settled us in at a table and ran across the street to the Eikeboom Butchery to pick up more provisions while our glasses were filled. We sampled a few wines, including South Africa’s unique Pinotage, a red that’s similar in body to a Pinot Noir. Hanli returned, showered us with bread sticks and then broke out the biltong. Call it jerky, but that don’t do it justice. The meat strips are tasty, salty, and spicy, and everyone eats it. Everyone. Even babies are given teething biltong. I first encountered biltong on the Rovos Rail. I spied a bowl of dark chocolate bits in a bowl in the lounge car, threw them in my mouth, and promptly spat them out. When you’re expecting chocolate and get dried meat, it’s a horror. But I learned to love it and its sister meat, droëwors – think snausages for people. We popped into one of the cute little shops and I immediately regretted my tight schedule that wouldn’t permit me any boutiquing time in town. Then we visited the oldest standing house in Stellenbosch. This one, like many of the other buildings in town, had a lovely thatched roof. They’re charming and terrifying – I can’t imagine living in a pile of kindling. Then we entered the Oude Werf, a recently renovated boutique hotel. The day was scorching, but our lunch was served on a vine-covered patio that was cool enough. We were served several South African favorites including snoek fishcakes, bobotie, and chicken pie, with a crisp white wine. Touring with me were Roberto and his family. Roberto came to South Africa from Naples as a boy during World War II. His father installed many beautiful terrazzo floors throughout the country. He and his wife were accompanied by their daughter, her partner, and their son Lucca who were visiting from Australia. I quizzed them and Hanli about Woolworth’s. I was astonished to see the old five and dime name on stores in South Africa. Was it possible that a long-defunct U.S. brand that originated in Utica, New York, was alive and well halfway around the globe? Nah. It’s not affiliated, but the large department store chain features incredible food markets, kind of an upscale version of a Super Walmart. We scooted across the street to the Coopmanhuijs Hotel for tea and sweets. Indigenous teas are a mainstay of South African life and we sampled several, including honeybush and buchu, but I fell – hard – for the rooibos, which is widely available in the States. Served alongside the tea was rusk, the South African version of biscotti. Apparently the quality of your homemade rusk is the test by which your baking skills are assessed. 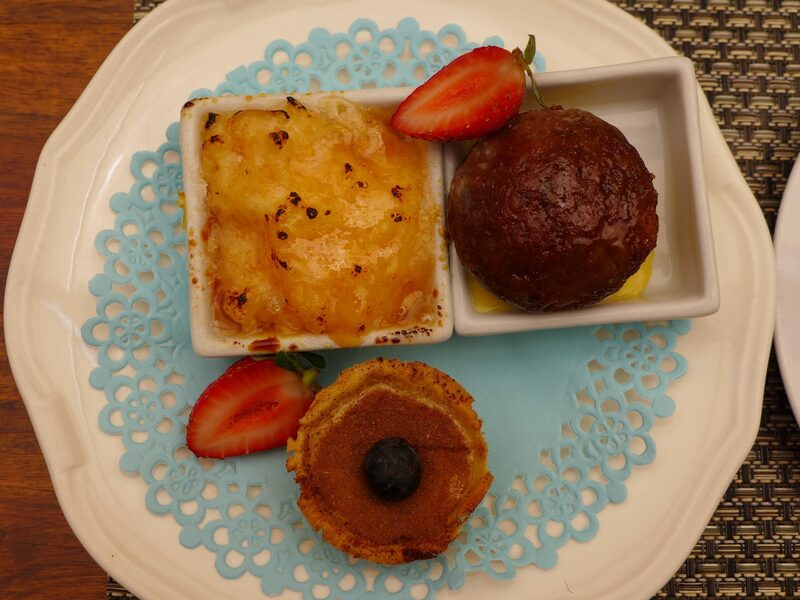 Additional sweet samplings included milktart and sago and malva puddings. They were good, but I’m always disappointed if chocolate’s not involved. As a parting gift, Hanli gave us a bag of nostalgic candies, the South African equivalent of American Lick ‘Em Sticks, Sweet Tarts, and Bazooka. I bid Hanli and our group farewell, and wished there’d been some caffeine in the tea because I was off to sample some wines. My destination was the Waterford Estate. Visitors to Stellenbosh often power tour as many vineyards and tastings as possible because they’re all very beautiful and uniquely styled. Some feature dramatic tasting rooms; others are rustic cottages. I opted for a wine safari at Waterford where guests are popped into a large jeep and taken to different spots in the vineyard to sample the goods. I was welcomed by Nache (short for Grenache), one of the estate Rhodesian Ridgebacks, and Chris, our guide. Waterford is owned and operated as a partnership between respected winemaker Kevin Arnold and Jeremy Ord. The centerpiece of the estate is a magnificent building constructed out of native sandstone. The commitment here is to sustainable farming and 1/2 the land is left undeveloped which gives the property a feeling of untamed elegance. Chris showed our group the production facilities and holding room which looked like a wine church to me, with the barrels serving as sober penitents. Then we set off in the jeep. The gentlemen joining me were doctors from the States on a weeklong tour of South African vineyards. They had one goal – to acquire and ship wine to stock their home cellars. I often forget that people do indeed have that kind of money. We stopped at several spots on the estate to sample nine wines with different edibles including olives, nuts, biltong (surprise! ), and chocolate. Chris, our guide, was friendly and knowledgeable. The doctors bolted rather abruptly; they had more wine to buy. I asked about shipping wines to the States – was it possible and affordable for the working class? Luckily, the answer was yes, thanks to the depressed rand. A day trip to Stellenbosch is mandatory, if you’re visiting the Cape Town area. The region’s cuisine is rich yet simple. Throughout my trip, I was constantly reminded of Northern California, another region that relies for taste on the quality of local, fresh ingredients. As for the wine, I’m not a sophisticate; I drink what tastes good to me. 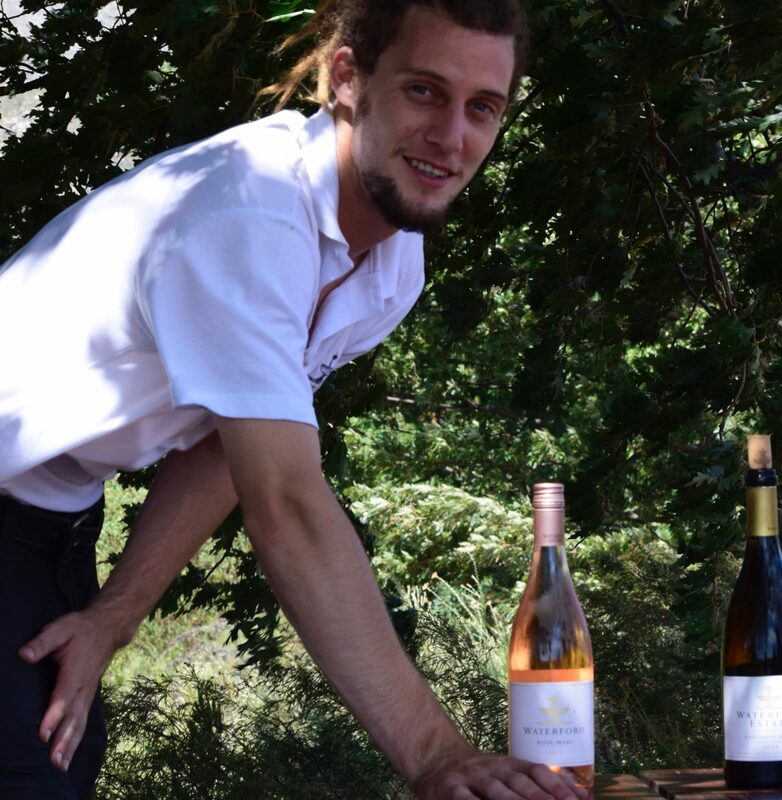 In Stellenbosch, my naiveté was not ridiculed because the vibe is casual and enthusiastic – wine snobs are welcome to check their pretense at the door. Tell Us About Your Best (Worst) Wine Tasting Experience! Yum, Yum, Yum!! You had me at biltong! I too am addicted to Rooibos, especially when it is zero degrees outside! I fell in love with it 20 years ago in SA, then found a really great bag of it in the Born in Barcelona; every cup reminds me of two of the world’s greatest places. I’m almost out — makes me itchy to find my next adventure!! (And I really miss eating rusks for breakfast — that is a very civilized way to start the day….) Thanks for the field trip on this grey wet morning!! So happy to put a smile on your face. If you’re desperate for a rooibos fix, Tazo makes a blend with citrus. It’ll do in a pinch! I loved this post from start to finish.